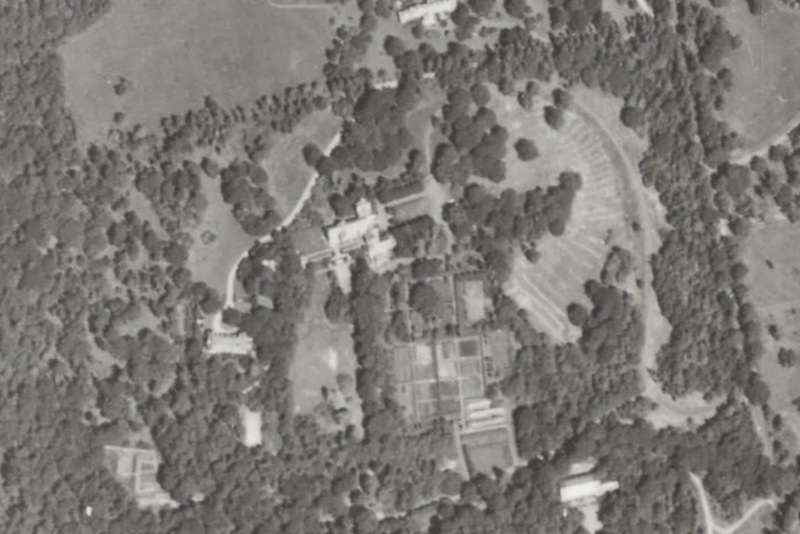 A 1938 aerial of 'Killenworth', the George D. Pratt estate designed by Trowbridge & Ackerman c. 1913 and 'Poplar Hill', the Frederic B. Pratt estate designed by Charles Platt between 1917-1924 in Glen Cove. Click HERE for more on 'Killenworth' and HERE for more on 'Poplar Hill'. Photo from Stony Brook University's Digital Archive. Except for the Glengariff Nursing Home expansion at ‘Popular Hill’ the comparison is pretty favorable (my opinion). Would anyone know why the road up to ‘Popular Hill’ in the 1938 photo is so white compared to the rest of the roads? It would be interesting to piece together the 1938 maps of the entire Pratt Compound – an ambitious vision a father had for his family that was short-lived. 'Poplar' not 'Popular' -- sorry, spellcheck is not always my friend. I've always found it interesting that on such a large property the two houses should be as close together as suburban houses. I suppose it's the view from the high point of the property. Doug, the whiteness of the road is as simple as the type of gravel chosen.